← The Queen Tweets For The First Time! #OMG! Is Benedict Cumberbatch In The New Star Wars? Saying “Penguins” and The Photobomb To End Them All! 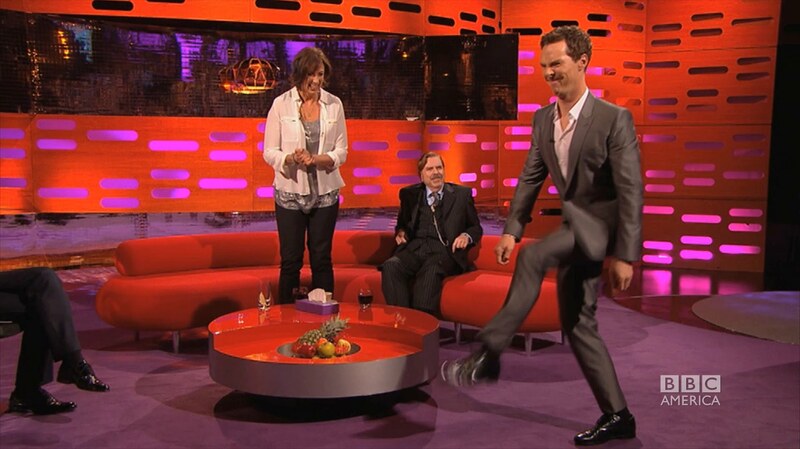 Wow, did Benedict Cumberbatch give the CumberFans a lot of fantastic viewing to indulge in when he popped in on The Graham Norton Show this week. Covering a slew of juicy and hysterical topics such as…IS he in the new Star Wars? Why can’t he say the word “penguin” and a priceless moment where he photobombs his own wax figure…it all made for another memorable appearance on The GNS! The King of the Photobombs….photobombs himself! The Sherlock star sat down with Norton, alongside fellow guests Miranda Hart and Timothy Spalling, soon to be seen in Mike Leigh’s “Mr Turner”, to talk about his upcoming role in “The Imitation Game” where his performance as the Enigma codebreaking, Alan Turing is already generating Oscar buzz! But the highlights of the show were, without a doubt, his evasiveness when asked about whether or not he’s in either of the upcoming “Star Trek” or “Star Wars” movies to which he replied “no comment”. All he would concede to is that he visited the set of Star Wars, which he says was like “walking through my childhood”. But, when pushed on whether he was actually APPEARING in the film, the Cumberbabe again said, “no comment”. No comment! WOW! That’s not a yes…but it’s definitely not a no either! So what do we make of that? Might he actually be in the most anticipated Star Wars film ever? If so, who do you think he might be portraying? Perhaps Anakin the son of Han Solo and Princess Leia?? He’s about the right age-range-ish. Or maybe he just makes a Hitchcockian appearance as an extra “Jedi” fighter?? Either way, it is shrouded in secrecy! There was also some rather humorous time spent on whether or not Benedict can say the word “penguin” which quite surprisingly and hysterically…he can’t. Well, he CAN….it’s just that in a recent documentary he narrated he kept saying “penween”…instead of penGWIN. So of course Norton spent a good amount of time taking the piss out of him for that…to which Cumberbatch wondered aloud why he alone is taking full blame on this when the producers that were with him in the recording booth SURELY could have corrected him! Quite right! Lucky Miranda Hart getting an up-close and personal peek at Smaug in the flesh! The two of them also had a lot of fun showing off their cat-walks! 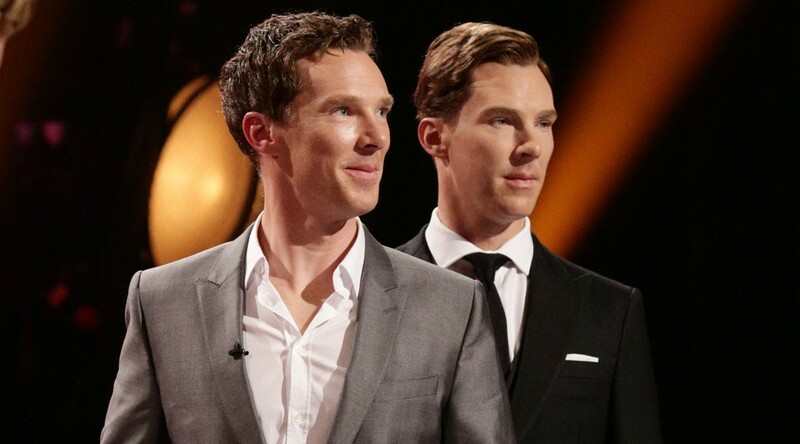 However, The moment sure to become a fan favorite is when Benedict is shown his Madame Tussauds wax figure for the FIRST time! Tussauds unveiled the CumberFigure in London last week and Benedict has simply not had time to pop over to Marylebone Rd to see it. So, apparently Norton pulled some mighty impressive strings and had the statue brought over to his studio! (Of course he did!) Not only did he arrange to introduce the CumberBabe to his wax likeness but he proposed that Benedict actually photobomb his own statue! I think that one tops the U2 photobombing for me. And what do we think of the likeness? May I have both please? 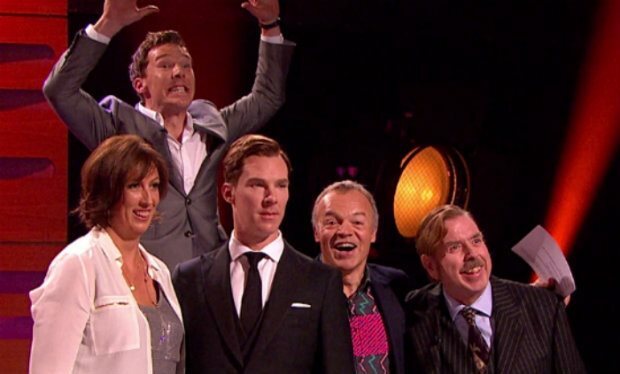 It’s always entertaining when Cumberbatch pops over to the Graham Norton Show and it never disappoints. I think I shall invite both over for tea sometime…. Lady Anglophile….wondering if one may order a copy Cumberstatue for her salon! This entry was posted in The CumberWatch and tagged gen. Bookmark the permalink. 2 Responses to Is Benedict Cumberbatch In The New Star Wars? Saying “Penguins” and The Photobomb To End Them All! Oh I needed that laugh! He is SO funny!